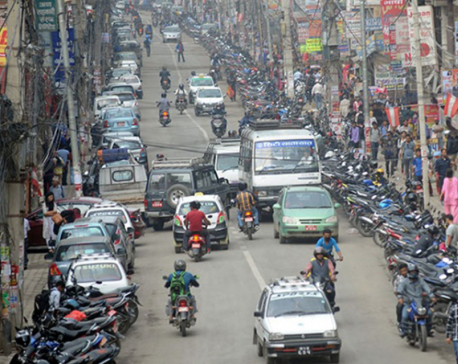 KATHMANDU, July 4: As many as 143 temporary parking lots have been put in place in various places across the Kathmandu Valley in view of effective traffic management in the Valley. 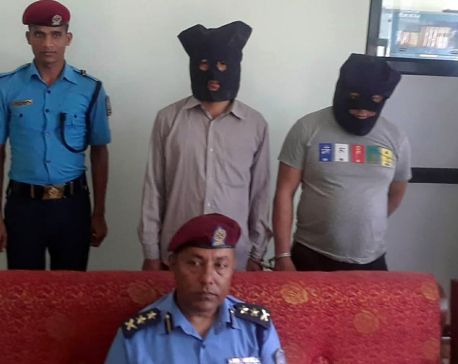 BIRATNAGAR, April 23: Police has arrested two persons on the charge of their alleged involvement in detonating a bomb near the Indian Embassy's Temporary Office in Biratnagar. KATHMANDU, Mar 30: Following protests from student unions, the government on Friday postponed the temporary teachers' exams scheduled to start from April 6. 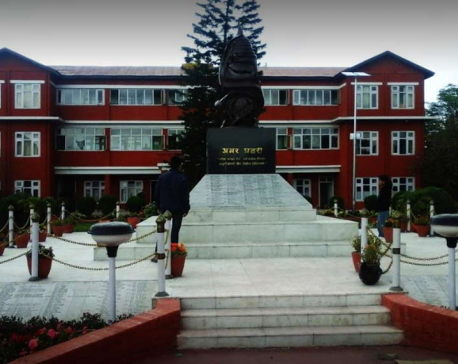 Following the government's decision, the student unions affiliated to the three major political parties - CPN-UML, CPN (Maoist Center) and Nepali Congress (NC) - also put off their indefinite educational strike scheduled to start on Sunday. 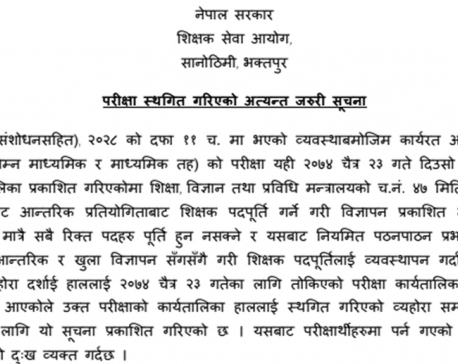 KATHMANDU, Mar 30: The examination of temporary teachers has been postponed indefinitely. 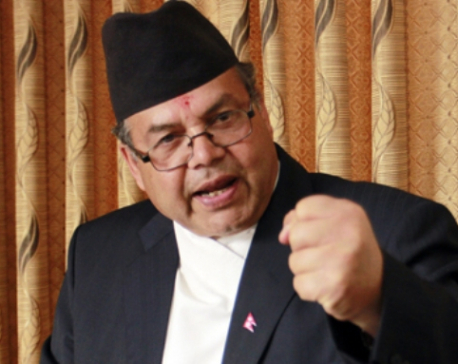 KATHMANDU, Jan 20: CPN (UML) senior leader Jhalanath Khanal has said it was not appropriate to protest against the announcement of temporary capitals of provinces. 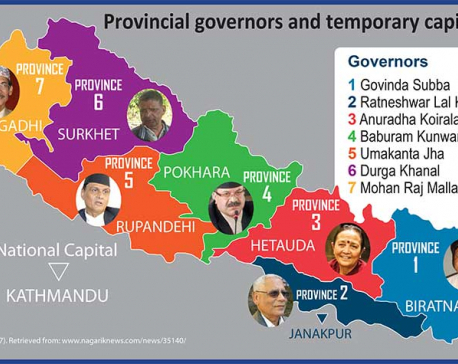 KATHMANDU, Jan 9: The government has said that it is working to announce the temporary capitals of the provinces. KATHMANDU, Jan 3: The Office of the Prime Minister and Council of Ministers (OPMCM) has said the news disseminated by some media on Tuesday that the government has fixed the temporary capitals of the provinces has drawn its attention. KATHMANDU, Jan 3: In a bid to fix temporary capitals for the federal provinces, the Office of the Prime Minister and Council of Ministers prepared a list of the proposed seven provincial capitals, Tuesday. 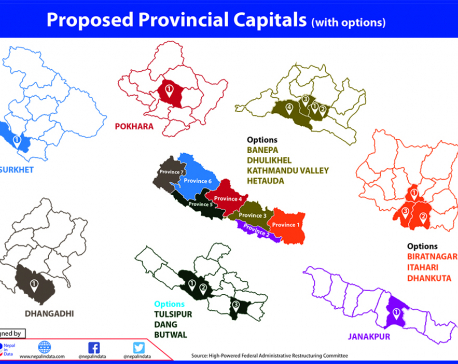 KATHMANDU, Jan 2: The government has prepared the outline of the temporary capitals of all the seven provinces in the country. KHOTANG, Dec 25: Pawan Rai served for two months and earned Rs. 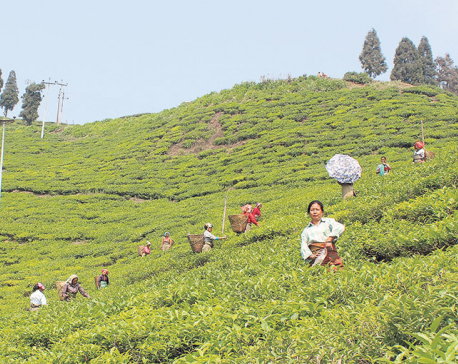 52,000 as temporary police in Khotang. A resident of Bahunidada of Halesi Tuwchung municipality-1, Rai plans to invest the earning in his education. KATHMANDU, Dec 24: Nepal Police has made it clear that there was no discrimination of payment and allowance to the temporary police persons mobilized during the elections. KALIKOT, Dec 24: ​Temporary police of Kalikot who were staging protests accusing the District Police Office (DPO) of misappropriating the budget meant for their salaries have intensified their protests after the death of a fellow temporary policeman on Friday. 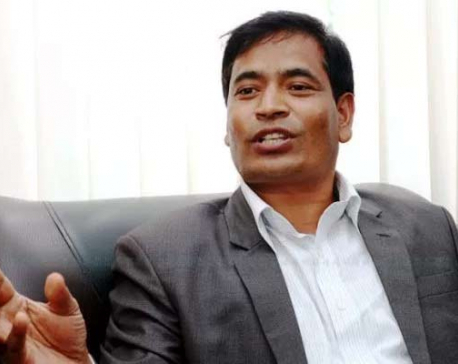 KATHMANDU, Dec 23: Minister without portfolio Mahendra Bahadur Shahi has called for an investigation into the death of temporary police person Bibek Yedi and stern action against those involved in it. 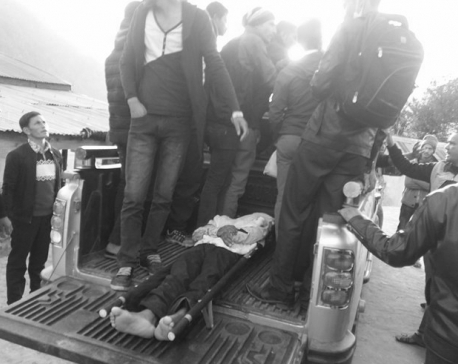 KALIKOT, Dec 22: A temporary (myadi) police died after a security personnel opened fire on him in the district. DOLAKHA, Dec 19: Upon knowing that the District Police Office (DPO), Dolakha had charged inflated price for each meal, temporary police protested against the police leadership yesterday. During the protest, police charged batons injuring more than a dozen. DARCHULA, Dec 14: A temporary (myadi) policeman died after he tripped over on Wednesday evening. The deceased is 19-year-old Rabindra Singh Thagunna of Sundamunda, Naugad rural municipality-2, police said. 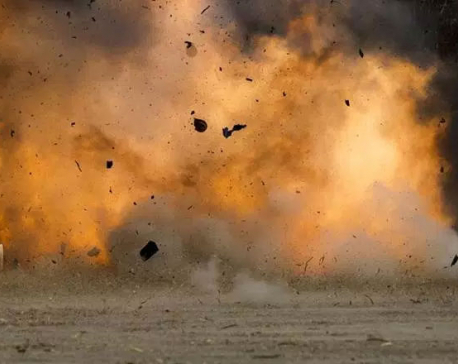 DANG, Nov 28: Eight people were injured in a bomb blast in Tulsipur on Monday. KHOTANG, Nov 16: Temporary police recruited for ensuring security in the upcoming parliamentary and provincial polls have been moblized to their respective workplaces in Khotang from Monday. Parsa, Nov 1: Three people have been arrested on the charge of cheating people by promising them a job as the myadi or temporary police. SURKHET, Nov 1: Since his childhood days, he wanted to become a policeman and dreamed of serving his country and the people. Despite his several efforts, he could not fulfill his dream. However, he has achieved a part of his dream by serving the country temporarily during the elections. DHANKUTA, Oct 24: A total of 46,302 people have submitted their applications for temporary police in Province 1 alone, for the upcoming provincial and parliamentary elections. According to the Eastern Regional Police Office (ERPO), the number of applicants is nearly three times more than the required number of temporary police. POKHARA, Oct 17: The number of candidates applying for the posts of temporary police for upcoming parliamentary elections has doubled the number of vacancies announced. KATHMANDU, Oct 11: The Ministry of Home Affairs (MoHA) is hiring 98,000 temporary police personnel for the upcoming parliamentary and provincial assembly elections. The move is reportedly being taken without consulting the Election Commission (EC), that too at a time when a lesser number of security personnel is expected to be required for the elections. KATHMANDU, August 23: The Teachers' Service Commission (TSC) has adjourned the pre-scheduled examination for temporary teachers. KATHMANDU, Aug 21: The agitating temporary schoolteachers ended the hunger strike on Monday after Ministry of Education agreed to take their examination after the amendment of the Education Bill. KATHMANDU, July 17: After the completion of the first and second phase of local elections except in Province No 2, across the country, these bodies are running through temporary laws. DHANKUTA, June 30: A temporary policeman, who was deputed at Khalsa Chintang Sahidbhumi Rural Municipality polling station, went missing after being swept away by the Tamor River in Dhankuta district since Friday afternoon. KATHMANDU, June 23: The agitating temporary schoolteachers have ended the hunger strike following a four-point deal with the Ministry of Education. 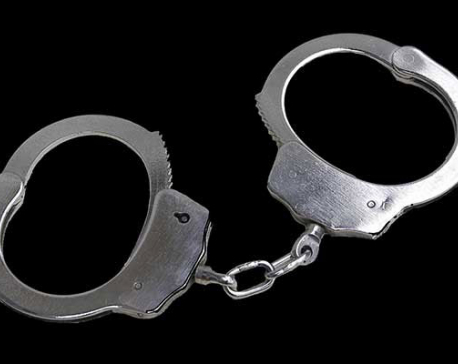 LALITPUR, May 25: A sniffer dog of the police has successfully tracked down a culprit allegedly involved in murdering a man. The trained dogs Liza and Jangi tracked down the murder sniffing the evidences found at the incident site. PYUTHAN, May 8: Inebriated temporary police have beaten villagers black and blue in the district. NAWALAPARASI, May 8: A temporary police recruited for the security in the local poll (May 14) was killed in a road accident Sunday night. 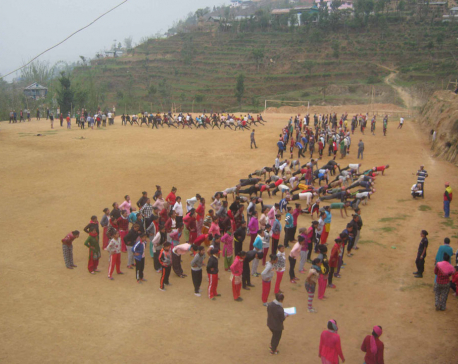 KHOTANG, April 19: Nepal Police has recruited 74,500 temporary police across the country for the security of upcoming local level elections. The selected candidates are going through the training process in all the 75 districts now. 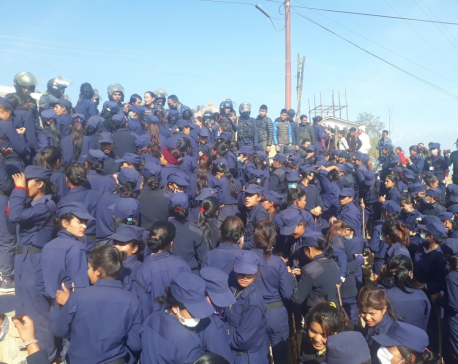 KATHMANDU, April 7: Nepal Police has hired 74, 500 temporary police to be mobilized during the upcoming local level elections scheduled to take place on May 14. Police headquarters informed Friday that the new recruits, including 13, 300 women, would be deputed across the country after providing required training. KATHMANDU, April 7: The Nepal Police has selected temporary police for the security of the upcoming local polls slated for May 14. With the upcoming polls just around the corner, youths, especially plus two level students across the country, who are temporary police aspirants, are participating in different physical activities as part of the test they need to pass to be selected as a temporary police for the local polls slated for May 14. JAJARKOT, April 2: Soniya Budha, a local of Dasharatpur, Surkhert is a 12th grader at Tribhuvan Higher Secondary School of Khalanga. She has to sit for her final examinations scheduled to begin on April 23.But without giving much priority to the exams, Budha has applied at the District Police Office to get hired as temporary police. BIRATNAGAR, April 2: With eyes full of dreams Tulasi Rajbanshi, 23, of Biratnagar-16 had reached the District Police Office, Morang. He thought if he got selected for temporary police that will open the doors for him to many job opportunities in the future as well. But unfortunately, he left the world on Saturday, before he could fulfill her dreams. KATHMANDU, March 25: Nepal police has invited applications for 75,000 temporary police targeting the upcoming local level elections scheduled to take place on May 14. In a notice issued on Friday, Nepal police headquarters said that the forms can be submitted at the District Police Office across the country until March 30. BHIMDATTANAGAR, March 22: The locals of a remote village here have been forced to pay for crossing a bridge over a local river. KATHMANDU, March 20: The Ministry of Home Affairs (MoHA) has prepared a proposal seeking permission from the cabinet to recruit 75,000 temporary police for the upcoming local polls. MoHA officials said that the hiring process of temporary police would start once the proposal gets approved by the cabinet. BHADRAPUR , Jan 25: The Israel-based Jhapa Society, an organisation of people from Jhapa district working in Israel, extended monetary help to construct temporary shelter for seven families displaced by the Kankai River flood that occurred last July. 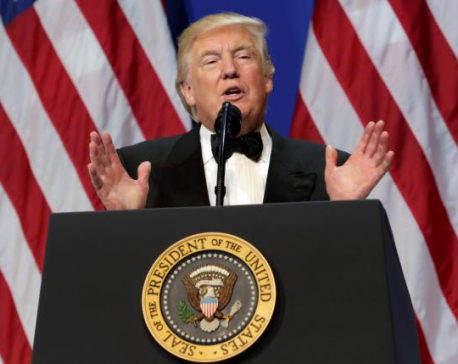 WASHINGTON, Jan 25: U.S. President Donald Trump is expected to sign executive orders starting on Wednesday that include a temporary ban on most refugees and a suspension of visas for citizens of Syria and six other Middle Eastern and African countries, say congressional aides and immigration experts briefed on the matter. KATHMANDU, Oct 29: The government is unlikely to address the demands of the agitating temporary teachers terming that their demands contravene the laws. KATHMANDU, Oct 19: Temporary school teachers who have been long demanding permanent status through internal competition continued their capital-based protests for the second day today.